During the week hubby broke a wine glass (again) and blamed the dishwasher (again). It seemed a shame to throw away yet another glass so I decided to have a bit of fun. About a week prior hubby had also broken a hanging terrarium in the bathroom. I had salvaged the cactus and moss and stones and had them stored in a plastic bag. So I decided to cut down the broken wine glass and create a mini succulent garden! I cut the glass using a diamond rotary cutting tool on my dremel. Then I smoothed down the rough edges with silicone carbide paper in varying textures, finishing with the finest. While the edges were smooth and not sharp they were a bit uneven – it was the first time I had used the dremel in this way. So I applied some copper foil used for leadlighting to the edge. Next I planted my rescued cactus and moss, and planted a cutting of succulent from my garden. I think it looks pretty cool! I find it important to recycle and reuse as much as possible, especially in the current political state of climate change scepticism. I also consider it important because as a ceramic artist I do use alot of gas, water and electricity. My clay and glaze ingredients have a large carbon footprint also, in terms of miles travelled and mining. I try as much as possible to offset this footprint by growing as much food as possible, composting waste, not using chemicals when cleaning, being a vegetarian, and of cause recycling as much as possible. Apart from that I am also firing the kiln today. The kiln contains the set of custom bowls I posted about last week and some student works. Tomorrow I will be glazing the bowls and reloading the kiln for glaze firing. Hopefully all will be on track to post the order on Tuesday. All going to plan I will post a pic of the finish bowls on Tuesday before I package them up. Sunday Studio Visit – a bit of photography! Its been a while since I posted – I have been sick in varying degrees (coming good, then not) for a few months now. I started with insomnia a few months ago which left me run down. I then came down with a virus which I couldn’t shift and which developed from there to a severe chest infection and virus induced asthma! I have never had asthma, so it has been weird! Due to ll of this I have been doing the bare minimum of what I need to do, and now that I am starting to feel better (I think) I am in catch up mode. As for today’s Sunday studio visit – I wasn’t in the studio today. Being a couple of weeks from Christmas we had a family Christmas lunch with a side from my partners family, which was lovely and relaxing. 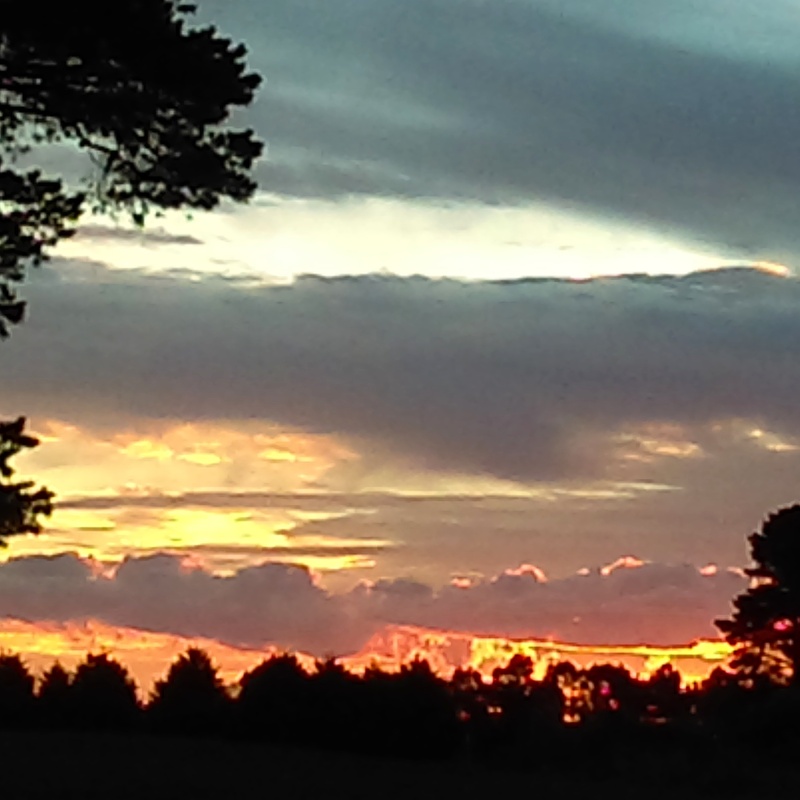 The weather was beautiful, which is only just starting to happen in Ballarat – so it was perfectly timed! The hosts live a big warehouse which they are slowly converting in a gorgeous home, and there were some fantastic views from the outdoor deck of the surrounds, which included some great geometric architectural juxtapositions which I couldn’t resist capturing on my phone. Sunday Studio Visit – a Sunday drive! There was no work happening in the studio today! This week was the final week of term for teaching pottery classes from my studio, and after three weeks of being sick it was time for a Sunday drive! This cold virus refuses to budge! It is better than it was two weeks ago, at least I feel half human now, but it just won’t release its slimy grip! We have had lots of rain here, particularly in the past week with 54 mls overnight last Tuesday – the following morning the studio was flooded for my Wednesday class and still very damp for Thursday night and Saturday morning classes. So DH & I decided to take advantage of the rainfall and visit a couple of the local waterfalls… yes ‘local’, lucky huh? I didn’t take pics as there were so many people having the same idea we did! So I took a couple of videos instead. Despite being Spring it was a typically cold Ballarat day but at least the rain held off, so the brolly could stay in the boot. The first video is Lal Lal falls, about a ten minute drive from where I live, and the second is Tretham Falls, about a fifty minute drive. The drive to Trentham was lovely with a coffee stop in Blackwood at a cute boutique cafe and then a stroll around Trentham, a quaint regional town in central Victoria, finishing with an icy cold beer at the local pub – just what we needed to finish off a busy teaching term. 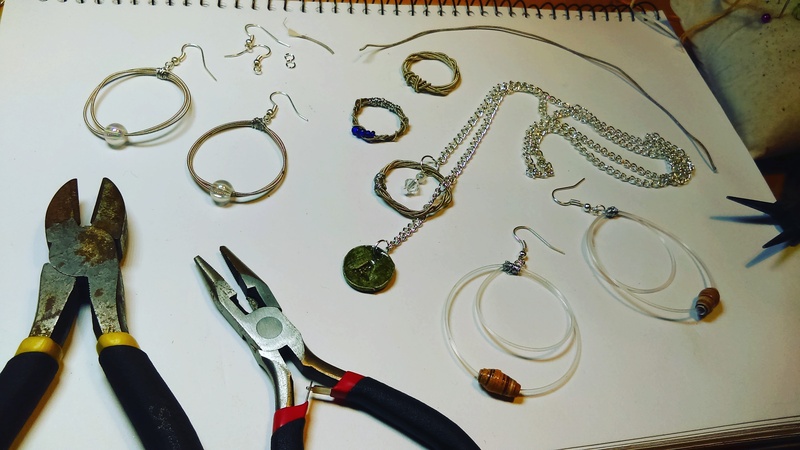 Sunday Studio Visit – Guitar String Jewellery & Fathers Day! 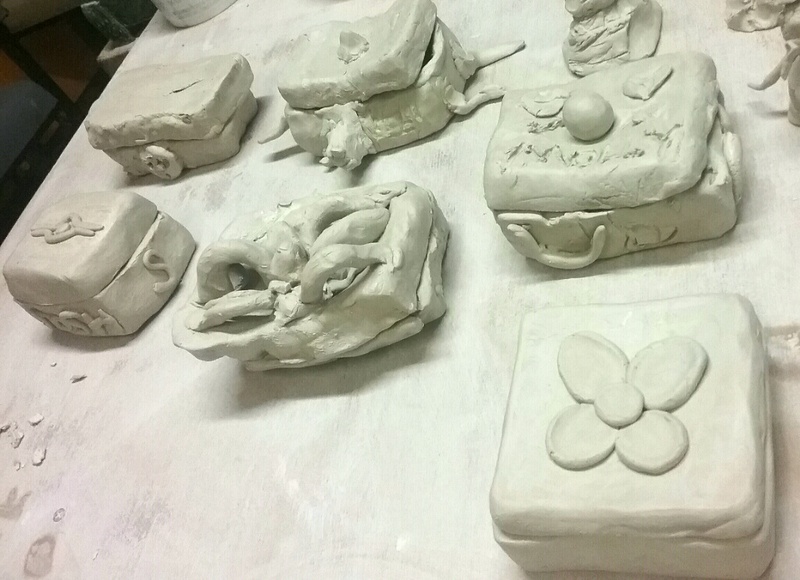 I did load the kiln with STUDENT works for a firing tomorrow, and am planning on doing some glazing on my custom orders tomorrow after unloading the bisque kiln. This evening I played around with some guitar string jewellery after being given a surprise box of goodies from a friend during the week. I’ve been making guitar string jewellery for a while because my partner plays guitar, and this surprise package had strings as well as lots of other jewellery making goodies! 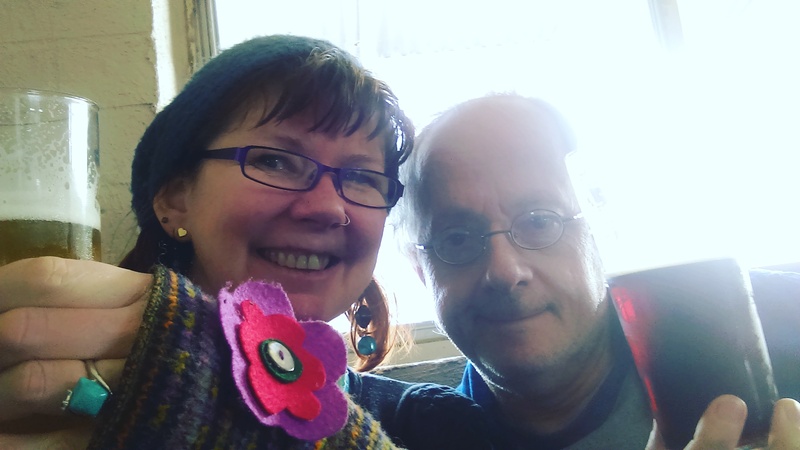 Sunday Studio Visit – more custom orders! This week I have glazed , fired and delivered some custom orders which I posted about in the last studio visit, and today I have been making more custom orders – yarn bowls and earring holders. Yarn bowls are very popular at the moment, so while my custom order is for one bowl, I have made six so that I can list some in my ETSY shop. I made extra earring holders so that I can list them also. When throwing multiples on the wheel I thrown on bats which makes it easier to throw a series of things, and also makes it easier to remove the thrown works without warping – warping is not desirable as clay has a memory, and during firing will often revert back to the shape it has been stretched into. 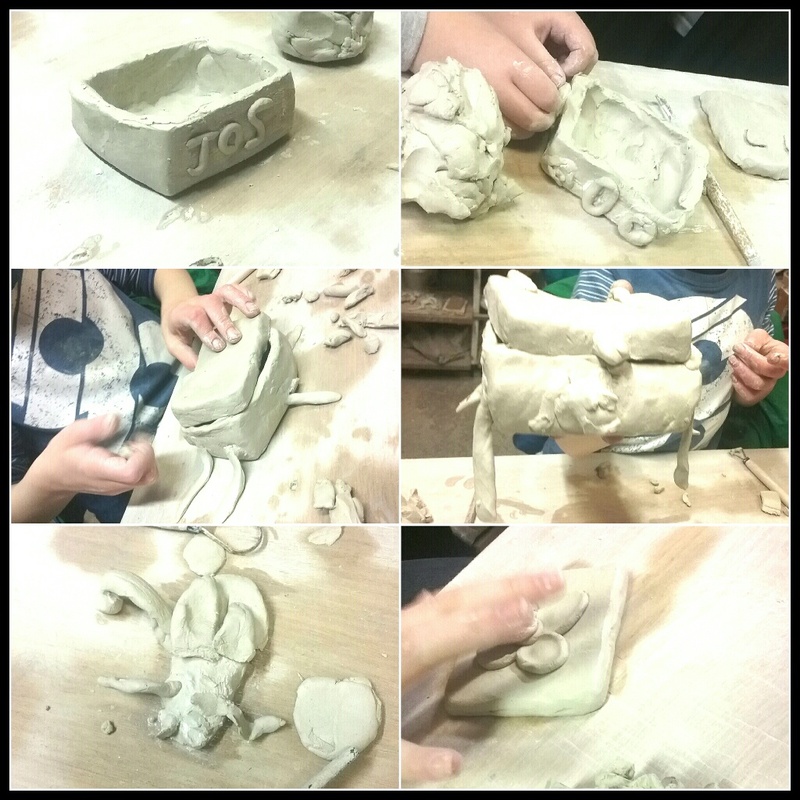 This is because the clay molecules realign themselves into what they were – hence the memory. Hopefully, all things going well, I will turn (trim) what I made today and carve out the holes needed to transform the forms into yarn bowls and earring holders. It has been a busy couple of weeks in the studio with a few custom orders from my ETSY shop, a local restaurant and a family member – plus I have had lots of kiln firing jobs from a local school, a local artist and the works created during the Scotsburn bushfire recovery art project, not to mention my normal firing schedule for classes and my own work! So it has been a busy few weeks. Today in the studio I loaded the kiln for firing tomorrow, and turned a set of cups and saucers, and attached handles, for a local restaurant. Here’s a video of me turning a cup, followed by pics of the making process. Although I didn’t make the champagne flues and mortar and pestles today, they are on my Sunday drying bench, so here’s a pic of them too…. The champagne flutes are a custom order from my ETSY shop – some are spares which will be listed in my shop after firing. Same with the mortar and pestles. Whenever I get orders I always make extras just to be on the safe side. Sunday Studio Visit – I am having a sale in my Etsy shop! 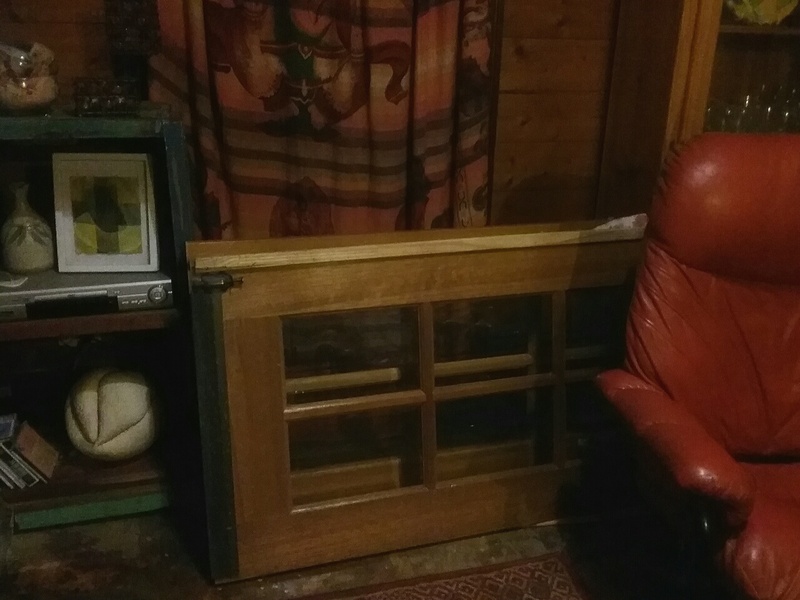 It is still cold and rainy here at the moment, and I currently have the doors from the studio off and drying out in the lounge room! With all the rain we’ve had they had swollen up and I couldn’t close them. So I am drying them out and am going to give them a couple of coats of varnish before rehanging them on Tuesday – before my school holiday workshop on Wednesday. Apart from that I loaded my two kilns with student works in preparation for bisque firings on Monday & Tuesday. 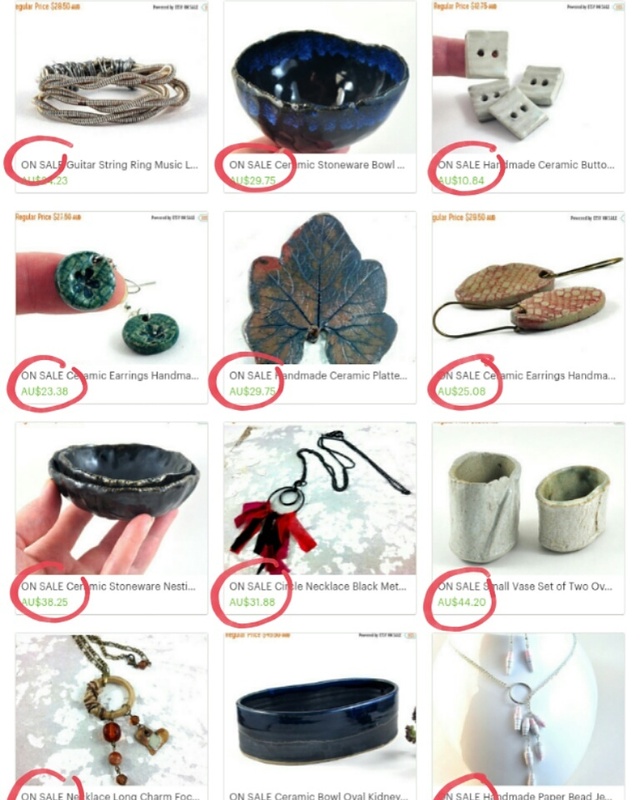 The other news is that I am having a sale in my Etsy store to celebrate Christmas in July, so I am spending a lot of time promoting that on Twitter, Instagram, Google+ and Facebook. Promotion is so time consuming, but absolutely necessary. 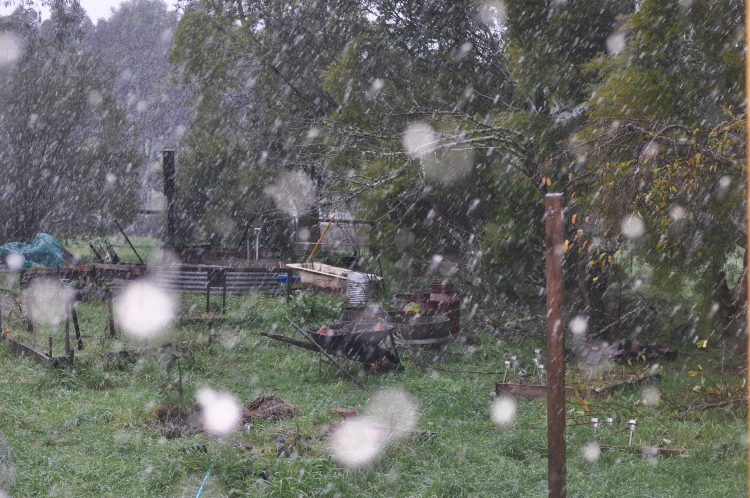 It has been freezing here over the past week… we even had snow a couple of days ago! Though there was no snow today it was still bitterly cold, and I had a birthday party booked into the studio for 2pm this afternoon – it was 5.1C at this time, so luckily I had loaded the up fireplace a few hours earlier to get the studio nice and warm for the party. 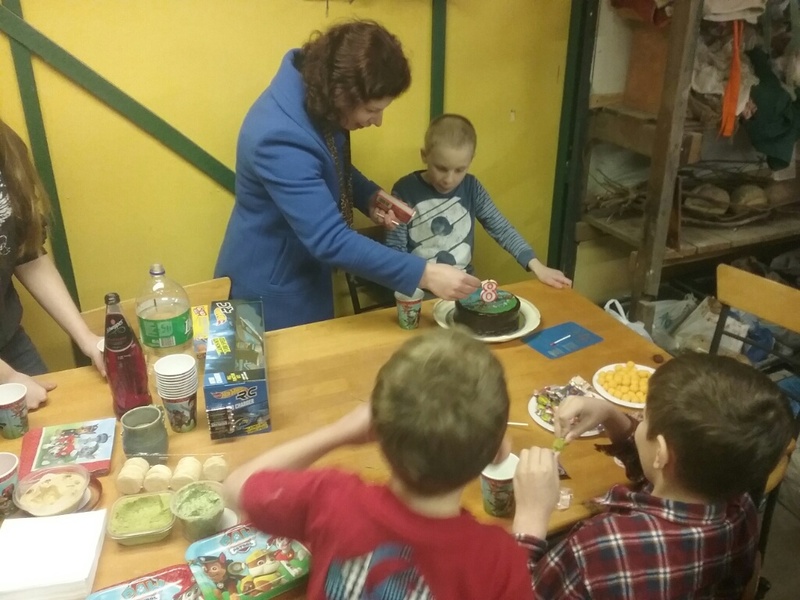 The party was for an 8yr old, and are a great healthy and creative alternative to fast food party venues, and saves parents the clean up if the party was at home! We made treasure boxes using the hollowing out method and then the children painted them with coloured slips. The treasure boxes then dry at the studio and I fire them with a clear glaze to make them shiny. The kids had a great time, as did the adults! 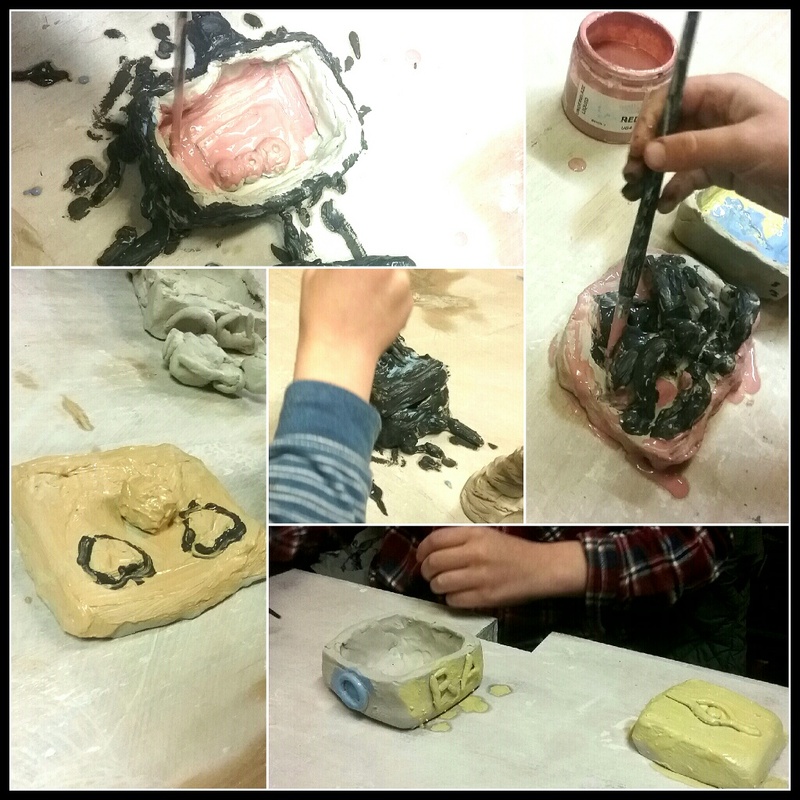 More information on parties – for adults and children – can be found on my ClayMotion website. The party went from 2-4 pm, and once over I let the fire die own and retreated inside my house…. it was way too cold to remain working in the studio, and I didn’t want to keep the fire going when I had one one roaring away in the lounge room. 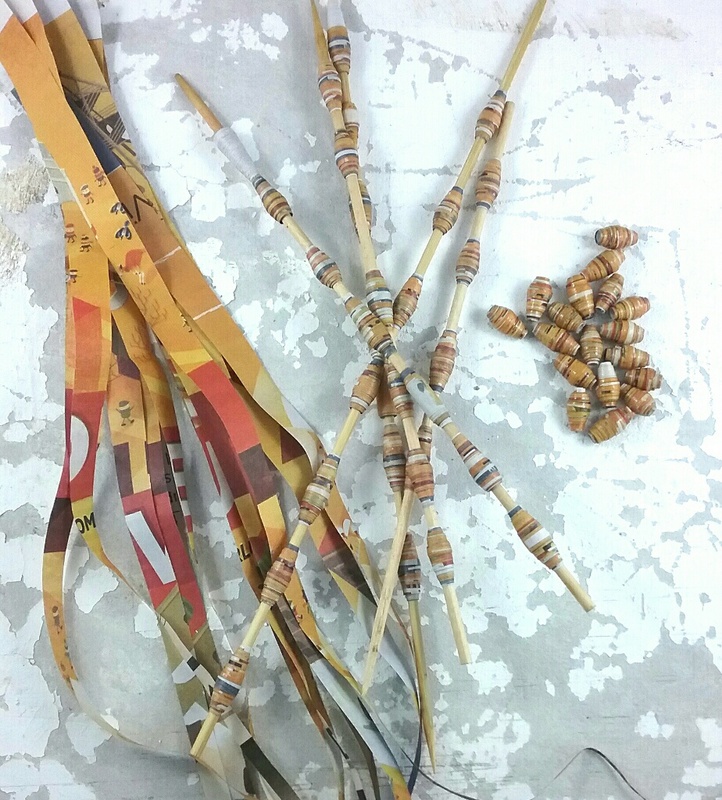 I then spent the afternoon making some paper beads, again keeping the winter theme! 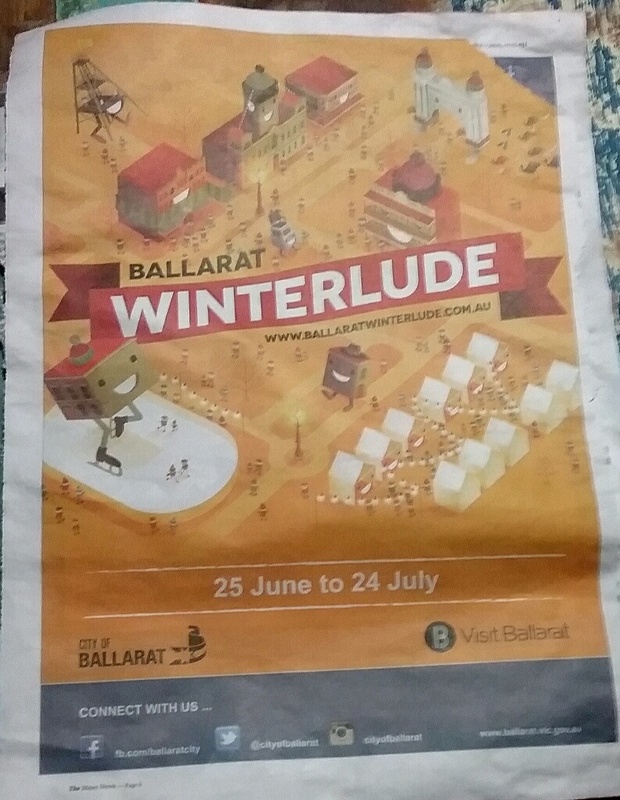 I live on the outskirts of Ballarat, a regional town in central Victoria, Australia, and for the second winter the council has organised a festival called Winterlude and one of the activities includes ice skating in the middle of the CBD. Advertising for this event includes full page spreads in the local paper and it is this advertisement I have used to make my beads. 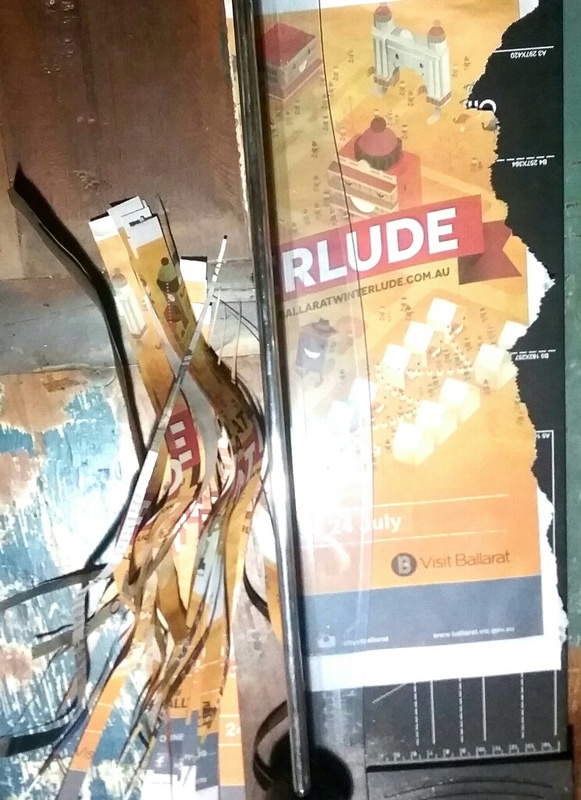 I used a guillotine to slice my paper, some skewers and PVA – yes, it is that simple and the effects are great. I have some paper bead jewellery currently in my ETSY shop and plan to add some more with these beads. Many years ago I had a studio/gallery separate to where I live and at this studio I had a huge brick kiln, unfortunately I don’t have any pics of the kiln, though I do of the studio. After a few life changes at the time I decided to downsize and relocate the studio to the garage at my home, which I did over the Christmas break of 2003-4, and have been slowly renovating ever since, the most recent being in the past few months and which I have posted about HERE. Over the past decade the studio has gone from tin garage to insulated, walled and painted studio, to studio with new entry and french doors, to the most recent extension. As part of the expansion I also acquired a ‘new’second hand kiln, which I have also posted about HERE. Now back to the huge brick kiln…. and today’s studio visit. When I relocated I pulled the kiln apart and brought all of the bricks and kiln shelves and props with me. The props I have been using ever since, but the kiln shelves were too long for the smaller kiln I also had at the time, and still have. As the kiln was large it had lots of kiln shelves. 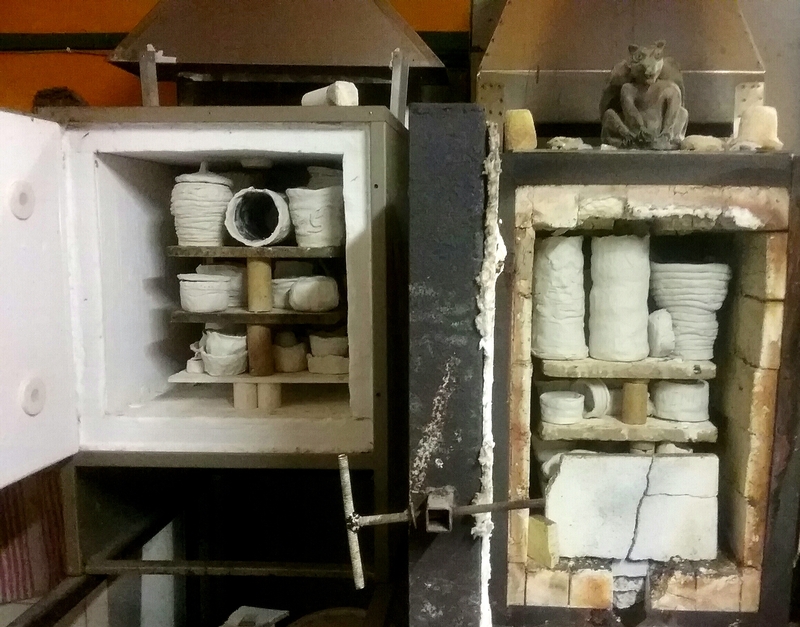 All of these kiln shelves are finally coming in handy for two reasons…. 1/ after many years of firing my smaller kiln to stoneware temperature the shelves have become warped. So today I (or should I say hubby) cut down some shelves to fit the kiln…. and 2/ bonus that the old shelves are the perfect fit for my new/old pert-o-kiln, well almost. They are fraction short on width, but perfect on length. And I have enough shelved for both with more left over! The other great leftover from the old studio/gallery was sandwich boards, a couple of which I still use now, but I did have a spare one….and amazingly they fitted precisely under the tables in the new glaze room so that I was able to convert them into mini trolleys with caster wheels to put glaze buckets on for storage under the tables. 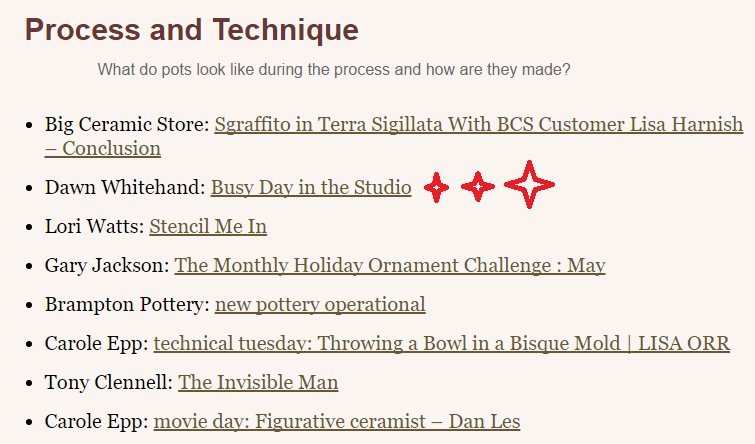 So now it is easy to pull the buckets in and out for simple access to the glazes. And the best part is that I am still recycling … even the castors were reclaimed from a couple of storage units I rescued from a dump site and am now using in the new renovation! Once all this outdoor work was finished I retired indoors into what I call the ‘jewellery room’ – basically a room inside the house I converted to a ‘clean’ studio when my kids moved out, much to their chagrin! I am really behind with product photography for my ETSY shop due to the studio renovations and really want to upload some new listings over the coming weeks – that means good photos! Apart from that I fired the kiln – the old one. I haven’t fired the new (old) kiln yet as I only cut the kiln shelves today. So tomorrow a new batch of kiln wash will be made and away I go!